After the success in bringing the original De Blob to modern consoles (you can read our review of that game here), THQ Nordic has decided to also bring its much-improved sequel to PlayStation 4 and Xbox One. It lands on February 27. In de Blob 2 you’ll have 12 new single player levels to play through, plenty of boss battles to enjoy, and even multiplayer action. The base game utilises the same colour mechanics as the original, but every feature has been enhanced and built upon - where de Blob was a proof of concept, the sequel is the one that really entrenched the fledgling series as something to take note of. Sadly, the original publisher of de Blob (the original THQ) then hit financial strife and we all thought that was the end of the series. THQ Nordic’s HD remasters of the original two games have breathed life back into it and who knows? Perhaps all these releases are a precursor to a de Blob 3. Wouldn’t that be nice to see? There is no such thing as too many digital pop stars. For one, we all know Queen Miku reigns suprime so we always know where to turn for guidance. But mostly they’re freaking adorable and stylish to boot, so I say the more the merrier! Believe it or not, this rant has a point: more digital pop stars are about to hit the scene/Switch in PriPara: All Perfect Stage. Developed by Takara Tomy A.R.T.S., the title promises both rhythm actions and fashion. Ummm is this Idolmaster meets Style Savvy?! I am all over this combination. Early purchasers will receive a download code for an exclusive Shion & Hibiki card set. Another bonus is planned, but will be announced at a later date. The latest (and possible rebrand?) 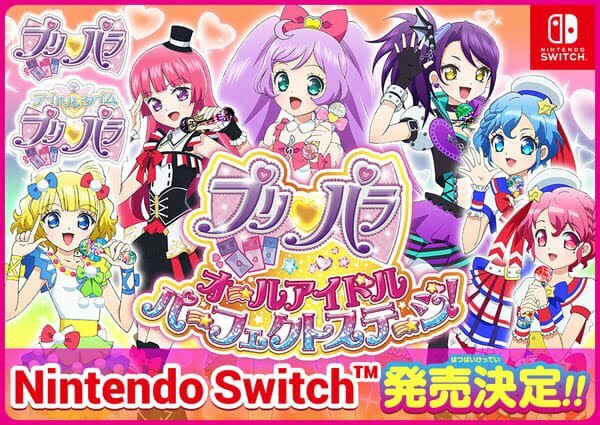 of the Pretty Rhythm series, PriPara: All Idol Perfect Stage will be launched on the Nintendo Switch in Japan on March 22. There is currently no news regarding a Western release. Now, usually I expect my visual novels to have cute anime characters in them. I don’t really care if they’re boys or girls, I just want them anime-style. But every so often a western developer will create a VN using a different set of aesthetics that still catches my eye. The Mind’s Eclipse is one such game. The black and white dark comic-style aesthetic that you see in the trailer sets up what I’m hoping will be a very intense narrative indeed. It’s gorgeous in its pulpy style, and the concept of the game is also very intriguing. From the press release: The CORE, a private research station, 2352. Celebrity scientist Jonathan Campbell awakens to a fallen utopia and must search for his loved ones, with the help of L, a mysterious companion. You won’t have to wait too long to play this one if if’s caught your eye as it has mine; the game releases on January 25. Remember Stories: The Path of Destinies? Its developer, one of my favourite from my home and native land Canadian, Spearhead Games has announced its next title. Omensight promises an engaging narrative, puzzle-solving gameplay, and time travel. Time travel! The world of Urralia has been completely destroyed. Luckily, the player becomes the Harbinger — a warrior who exists outside of time. You’ve foreseen the downfall of Urralia, which means it also falls into your hands to rewrite the future by identifying key characters in what is to come and deciding who to support. It’s a matter of perspective: the more angles you study, the better you can make your decisions. Even battles feature the element of time, as one of the Harbinger’s ability is to slow it down. The game’s structure seems tied to Stories, despite being very different titles; creative director Malik Boukhira states in a press release: “Players told us how they enjoyed manipulating time to collect all the different endings in the game ... What we like to call the ‘narrative puzzle’ will extend to a range of diverse characters in Omensight.” Omensight will be released for PC sometime this year; I’d also expect (hope for) a PlayStation 4 release.